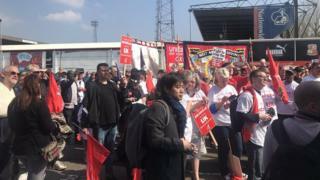 Image caption The Unite union said the "threat of closure couldn't come at a worse time"
Hundreds of workers from Swindon's Honda factory have taken part in a protest through the town urging the company not to close the plant. Last month Honda confirmed it would close the car plant in 2021, with the loss of about 3,500 jobs. The Unite union said the "decision couldn't come at a worse time" and it would "fight to keep Honda in Swindon". A Honda spokesman said it "recognised this is an unsettling time for our associates and the local community". The Japanese company builds 160,000 Honda Civics a year in Swindon - its only car factory in the EU. Patrick Renard, who works at Honda Logistics in Ghent in Belgium and is chairman of the European Workers Council Honda, travelled from Switzerland to support the workers. He said: "I do strongly believe there is a future for this plant in the global Honda world - so the Swindon factory has to stay open. "It is the backbone of Honda in Europe for the last 30 years, so we are pretty sure there will be a domino effect on the rest of Europe. There are production plants in Italy, Spain and France, and we believe this is the first step of Honda leaving Europe as an organisation. "So it's not only for the Swindon people, it's also for the European people on the continent that I'm here." Steve Preddy, from Unite, said: "Swindon has had a troubling downturn in its fortunes so this threat of closure couldn't come at a worse time. Too many decent jobs have been lost and not replaced. That hurts a community, as you can see it in the high street. "It would be a tragedy if Honda walks away from a town that has given that company so much, sending a loyal workforce to the dole queue. We can't and won't let that happen." Business Secretary Greg Clark said he would continue to try to persuade Honda to reverse its decision. He said: "I will continue to work jointly with associates, the trade unions, suppliers, Swindon Council, local MPs and the whole local community to make a joint case that is compelling and shows with evidence that this decision should be reversed." A Honda spokesman said: "We are consulting on this proposal with our associates and their representatives. It is not appropriate to pre-empt the outcome of this consultation or comment on its activities. "There is no time limit on how long consultation will last, however we anticipate that this will be longer than the minimum 45 days required by law."